In the center of Speyside you’ll find the Craigellachie Distillery, which for years has been a primary contributor to Dewar’s blended whiskies. 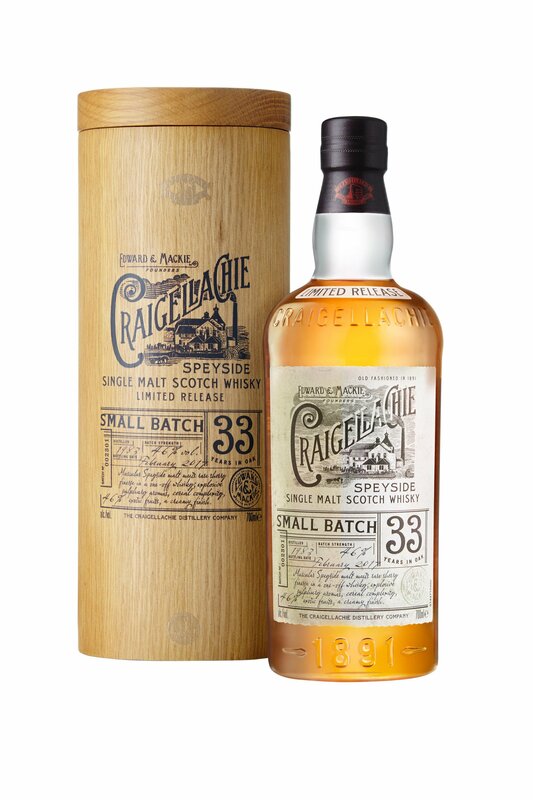 Lately, a few single malts bearing the Craigellachie name have been trickling onto the market and now we’re witnessing the oldest one in the modern era, a whopping 33 years of age. This travel retail release is comprised of just 1700 bottles, and rest assured you’ll pay for the privilege of sipping it. We scored a small sample to review. Thoughts follow. Considering the rarity and preciousness of this whisky, expectations are appropriate to be high. Fortunately, they are largely met. The nose is full of classically lush, old Speyside notes, a bit austere at times with some oily furniture polish character, but overall quite expressive with notes of almond, lemon peel, and a gentle, rolling cereal element that informs the entirety of the aroma. The palate is well-rounded, like a pebble that’s been shaped by a river for centuries, showcasing notes of honey, baking spice, and malted milk up front. In time, the influence of sherry makes a stronger appearance, giving the whisky a certain sharpness, one that helps to balance out the softer attack by building things to an appropriate crescendo. On the finish, the well-rounded whisky retreats to a slightly salty note, with a reprise of notes of almonds and toasted grains. Gorgeous.